Carry gear needs to be constantly tested, evaluated, and changed if necessary. About a month ago I switched holsters and retired the particular holster that I have used almost exclusively for my Glock 19 for almost 5 years. I am not sure if it is simply the nature of some new shirts that I have been wearing, but I suddenly found my garments snagging on the clip of the old and reliable holster. As with anything, what can go wrong will go wrong. Therefore, the old holster was tossed in the abandoned holster draw (you probably have one of those also if you have been carrying a gun for a while) and a new holster now carries my Glock 19 on my hip. That new holster is the Alien Gear Cloak Tuck 3.0 hybrid holster. I have been using the Cloak Tuck every day, all day, for over a month. I absolutely love it, which I find funny, since I never particularly liked hybrid holsters. This one is different from the others I have tried and I think it is these differences that have won me over. First of all, let me say, that I decided to try the Alien Gear holster due to it being highly recommended here at Concealed Nation. The other authors on this blog that have tried it have praised it and the vast majority of other reviews I have read have been positive. So, I figured I would give it a try. Just for the record, I brought mine. I did not get it for free and I am not in any sort of business relationship with Alien Gear so I will give you my honest opinion about the holster here. And my honest opinion is this: I think Alien Gear builds a better hybrid holster than anyone else and they also do it for less money than the competition. 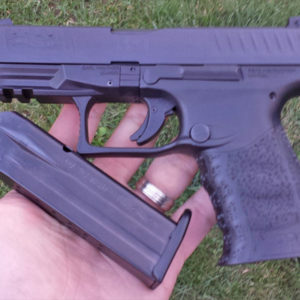 While I have nothing to gain personally from praising Alien Gear I do so without reservation because I am a shooter and a gun carrier and I respect a company in the firearms industry that builds a great product for a reasonable price. This holster is very comfortable, does not move around, retains the gun well, and provides a fast draw. 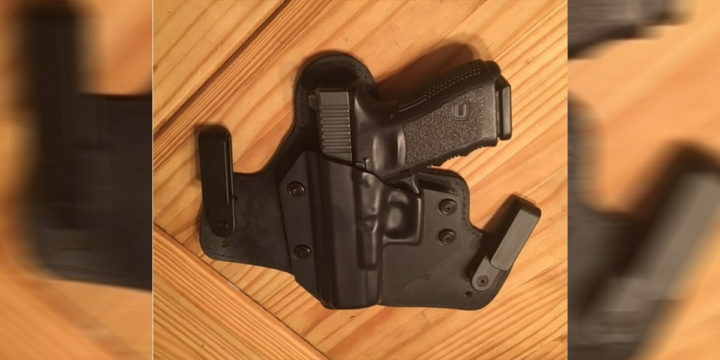 The best thing about this holster is the fact that it uses a backer made out of some kind of plastic and polyurethane that is comfortable against the body and does not warp with moisture as will leather, the typical material used for these backers. There is also a piece of steel within this backer that sits inside of the material beneath where the gun actually rides. This eliminates one issue that I have always hated about traditional hybrid holsters: the fact that they tend to warp and over time they can actually trap the gun in place, preventing a smooth draw. Another aspect of this holster that is really great is the fact that the retention is entirely adjustable. In fact, my holster came with 3 different sets of screws and spacers so that the tension on the gun is customizable. 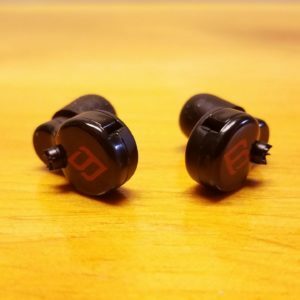 I personally used the widest spacers and these provide good retention yet a smooth draw stroke. The spacers sit between the backer and the kydex shell that holds the gun. 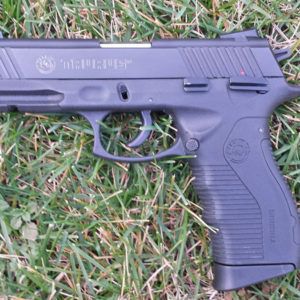 There is one slight knock I will make against this system, although it is simply an inevitable down-side to this customization potential, and that is you need to make sure that the screws are turned into the spacers with some tension or they can unintentionally fall out of the holster. Not a big deal, just be sure to use the spacers that allow you to have the desired retention while the screws are made fairly snug. Alien Gear allows you to choose other clip options for the holster but I just chose the standard nylon clips and they work great. They latch onto any belt I have tried and they do not snag on clothing during the draw the way other holsters I have tried do (including the holster I recently stopped using for just that reason). These clips can also be adjusted to change the depth and the cant of the gun. I use the clips on the default center hole setting and I find the depth and cant perfectly to my liking. This will be a matter of preference and Alien Gear gives us the ability to make changes to both cant and depth which is an awesome feature. Concerning reliability, it is true that I have only used this holster for a month, but I don’t foresee anything breaking as the build quality seems to be excellent. There is a good warranty if that proves not to be the case, but I don’t see anything going wrong on this impressively crafted piece of kit. When considering the purchase of a hybrid holster I will tell you this: the great benefit of this holster type is comfort and stability. 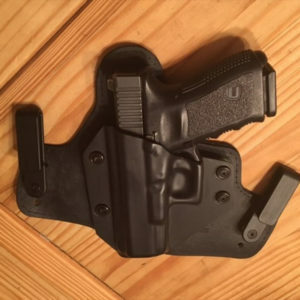 The holster is very comfortable due to the wide backer and since these holsters have two points of contact onto the belt that sit wide apart from each other they provide stability and the gun does not shift around throughout the day as typically happens with other types of in-the-waistband holsters. One potential downside to hybrid holsters is that they tend to take more time to put on compared to certain holster types that can be quickly clipped into place or removed. Obviously, to embrace the comfort and stability of a hybrid you must also accept the longer process of putting it on as I find they demand that you loosen your belt and pants to put into place. 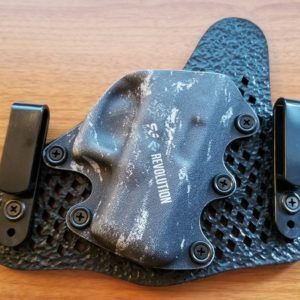 If you need to remove your gun and holster throughout the day for various reasons you may be better served with a different kind of holster, but if your gun goes on and stays on for the whole day, the Cloak Tuck 3.0 is hard to beat and proves more comfortable than most other holsters I have tried. If you are looking for great quality at a great price and want a holster that is comfortable, stable, conceals well, and is well crafted, I highly recommend Alien Gear.